The Hotel Europa has seen better days. The glamour of the past is fading and not everything works as well as it used to: the old fixtures are as impractical as the few remaining staff lorded over by a peculiar concierge who takes care of everything – in his own way. A group of guests from various countries meet at the hotel in what constitutes an encounter of personal backgrounds, cultures and temperaments. They complain a lot – both about each other and the hotel – they love and hate, fight and make up, harbour prejudices and sometimes see each other in a new and surprising light. What unites us and what separates us? Why do French people refuse to learn foreign languages? Are all Italians gigolos? Why do Spaniards take siesta? Are the English really such terrible cooks? And can Austrians and Germans find a common language after all? These and other questions are debated in an entertaining manner. 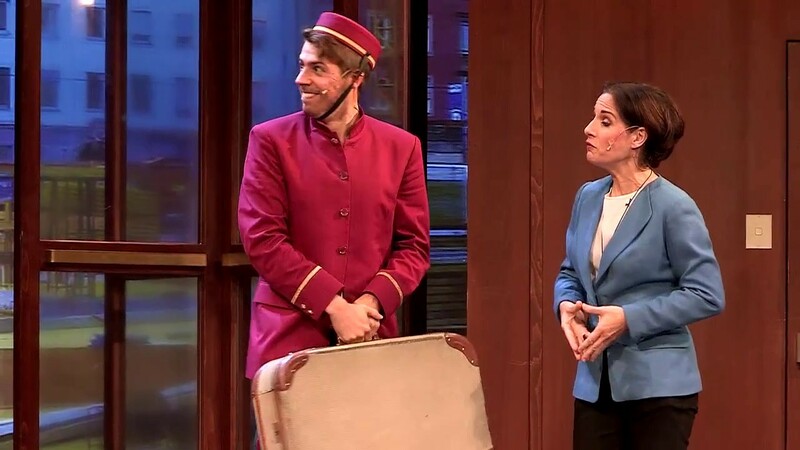 “Hotel Europa” is a song recital about old clichés and new realities; an appeal to take a humorous approach to ourselves and our European neighbours. The musical revue features songs and chansons from the Comedian Harmonists to Queen, from “Je ne regrette rien” to “I Will Survive”, and it stars singing Europeans and people aspiring to be just that. Marco Dott (*1974) has been a member of the acting ensemble since 2009 and also writes and directs. Together with Moritz Seibert he wrote the plays “Koka – Weißes Gold”, “Johnny, My Friend” (based on the novel by P. Pohl) and “Crazy” (based on the novel by B. Lebert) for the Junges Theater Bonn. For the Salzburg State Theatre he has for instance adapted and staged “Momo” (M. Ende), “Brave New World” (A. Huxley) and “The Chorus / Les Choristes” (based on the French film of the same name). Eva Musil studied set design with Prof. H. Kapplmüller at the Mozarteum University and has regularly served as a production designer for operas and plays at the Salzburg State Theatre since 2011. “Hotel Europa” is her third collaboration with Marco Dott: she also designed the Austrian premiere of “Fury” (2015) and Georg Kreisler’s “Heute Abend: Lola Blau” (2016).